Morocco defender Abdeslam Ouaddou has left Greek champions Olympiakos, just six months after joining the club. 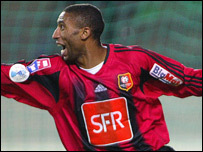 The 28-year-old joined the Piraeus club from the French side Rennes in June. But he has been forced to leave Greece and return to France because of family problems. "The only reason for my decision is that my wife is suffering from depression and, for me, family is the most important thing," Ouaddou said. "I had a very good contract, but I can't be 100% concentrated on football and I wouldn't allow myself to get paid for mediocre performances. "The club understood my situation and therefore we reached this decision. "I know I had the quality to succeed at Olympiakos, but sometimes problems crop up in our lives which take things in a different direction. "Now I am returning to France to be near my family." The former Fulham centre-back only made one Champions League appearance for Olympiakos and breaks a contract that would have taken him to 2010.